Leaks in your roof can develop slowly over time as the roof ages or they can happen quickly due to storm damage or a falling tree branch. 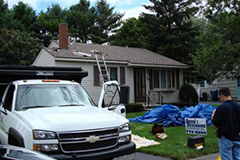 If your roof is still in good shape overall, repairs are relatively simple. If you don't have prior roofing experience, it's important to call a professional rather than undertaking these steps yourself. Before you begin repairs, you'll need to know how extensive the damage is. Sometimes the damage is immediately apparent (a tree branch has pierced your roof). 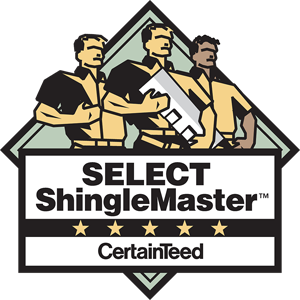 Other times, you'll need to explore underneath the shingles to find out how much wood has been damaged from a slowly developing leak. Remove shingles over the damaged area - You'll need to use a pry bar or hammer claw to help pull the nails out of the shingles around the hole or leak. If the hole is small, you can cut out just the bad tabs instead of removing the entire shingle. Cut out damaged wood - If you're repairing a vent hole or other architectural hole in the roof, you may not need remove any additional wood. If the hole is due to damage, however, you'll need to cut a rectangle around the area in order to remove all rotted or splintered wood. The method you use to repair the roof sheathing will differ depending on the size of the hole. No matter which method you use, make sure the patch is well-supported in order to prevent additional damage or leaks. Small Holes - For holes six inches in diameter or smaller, insert a board under the hole and screw it to the existing roof deck. The board should be at least three times as long as the diameter of the hole. Next, insert the patch and screw it to the board. Large Holes - When repairing a hole larger than six inches in diameter, cut the sheathing back to the rafters. Insert 2x4 supports along the edges of the patch area and attach the supports to the rafters. This is an essential step to keep the plywood from flexing and causing additional leaks. Finally, use plywood the same thickness as the existing roof deck to fill the hole. With your plywood patch in place the final step is to replace the damaged shingles. Lay down tar paper - Nail tar paper over the area of patched wood. If more than one sheet of paper is needed, make sure the upper sheet overlaps the lower by at least two inches. Install new shingles - Beginning with the bottom row, install new shingles to cover the patch. The flaps from each successive row of shingles should overlap the row beneath. On the last row, tuck the straight edges under the existing shingle and nail in place. Cover each nail with roofing tar to protect the roof from water damage. Leaky roofs can cause major damage to the drywall and flooring of your home. That's why it is essential that leaks be repaired professionally. 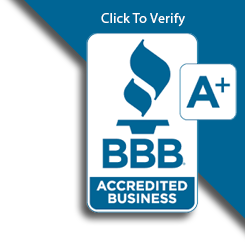 We'll help you assess leaks and other roof problems and complete the repairs as quickly as possible in order to prevent further damage to your home.